"Yeah, I'm a thrill seeker, but crikey, education's the most important thing." Stephen Robert Irwin (22 February 1962 – 4 September 2006), most commonly known as Steve Irwin, was the owner and manager of the Australia Zoo at Beerwah, Queensland, Australia. 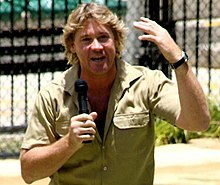 He was best known for the unconventional nature documentary series The Crocodile Hunter. I think my path would have always gone back to or delivered me to wildlife. I think wildlife is just like a magnet, and it's something that I can't help. 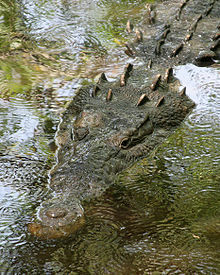 "If something ever happens to me, people are gonna be like 'we knew a croc would get him!'" I have a deep-seated respect for parrots. As gifted as I am with all other wildlife, parrots have this uncanny desire to kill me. I'm not sure why, but they're like my kryptonite! I'm very embarrassing to look at. You know why? Here's why I'm embarrassing: 'cause there's a little bit of me in everybody... I'm like the boy that never grew up. I'm very, very passionate about what I do. I mean, I love what I do....and people are like "God, give this guy a valium or something, you know? Can't he have a bad day?" I've got the Terri factor, mate. I've got this wife that is so incredibly intelligent and strong that I reckon, between us, we'll get through it. I don't know, man; don't worry about it.